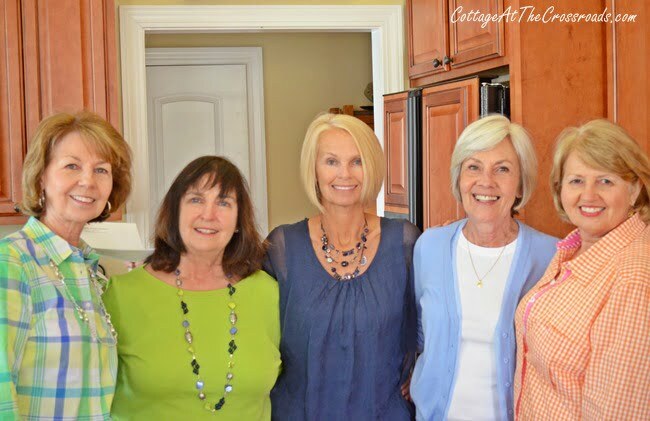 Last Saturday I spent the most wonderful day with a group of girls that I used to play Bunko with when I lived in Columbia, SC. 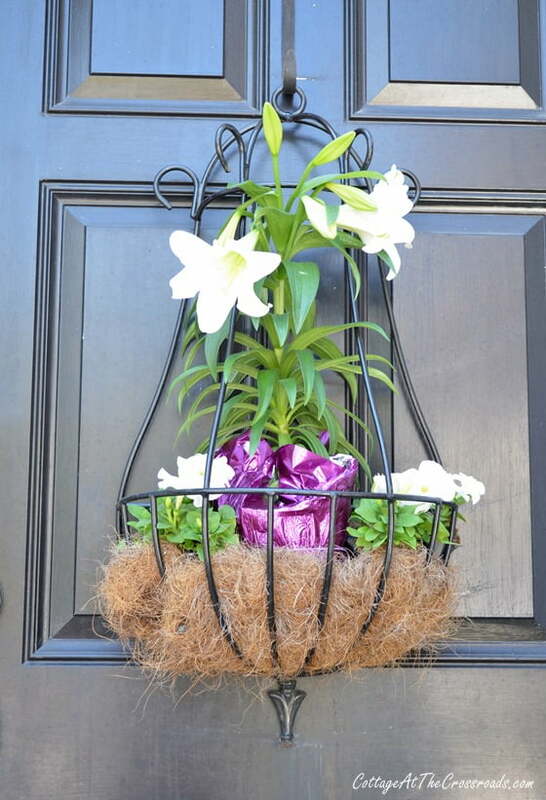 My friend Nancy hosted lunch at her house, and from the moment I saw this Easter door decoration, I knew this was going to be special. 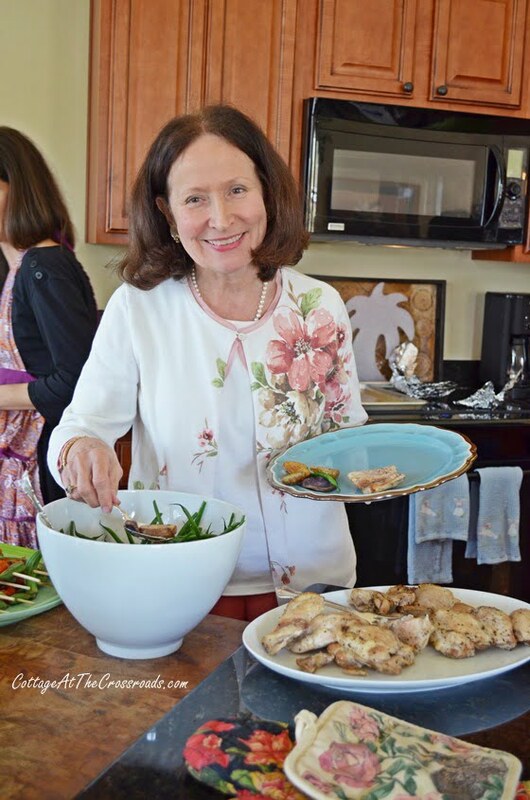 The reason we were getting together was because Nancy’s daughter-in-law, Rachael, was introducing us to her healthy cooking classes. Rachael is a registered dietitian and diabetes educator, and she is opening her own business in Columbia, SC very soon. She offered to prepare a healthy lunch for our group to demonstrate how fun her nutrition classes can be. While Rachael was doing some prep work, I took a look around the dining room. 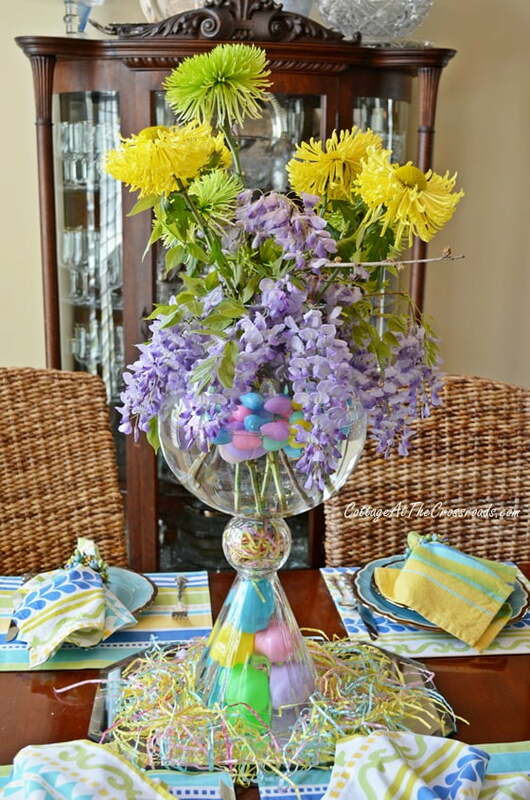 Nancy had set a beautiful spring table for us including this gorgeous centerpiece with eggs and pretty flowers. That’s wisteria coming out of the bowl. I would have never thought to use it in an arrangement, but Nancy is a master at using flora found in the woods and banks in decorating her home. 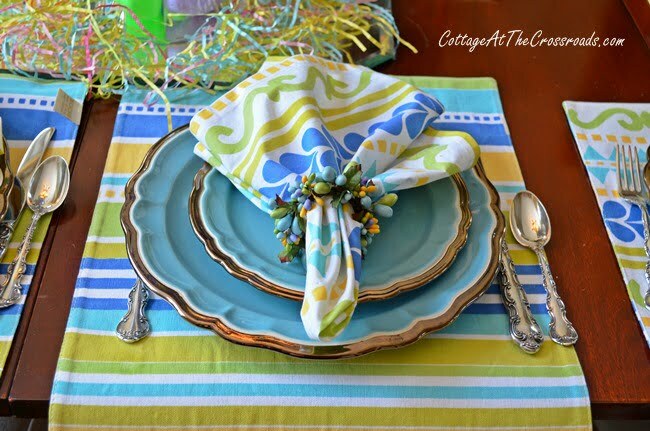 The table was set with these beautiful spring linens and dishes. 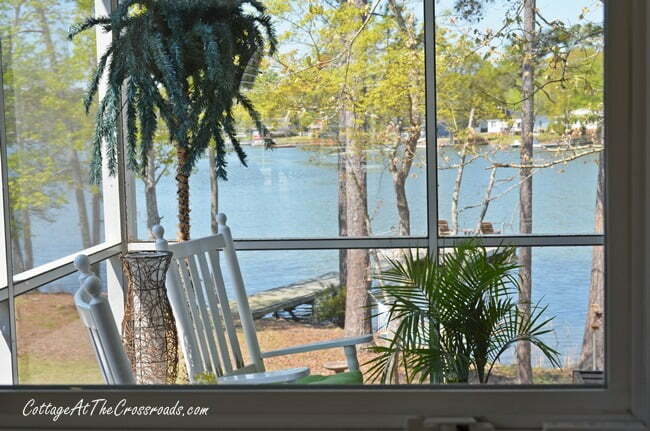 Nancy lives on the lake and has a beautiful view outside her windows. 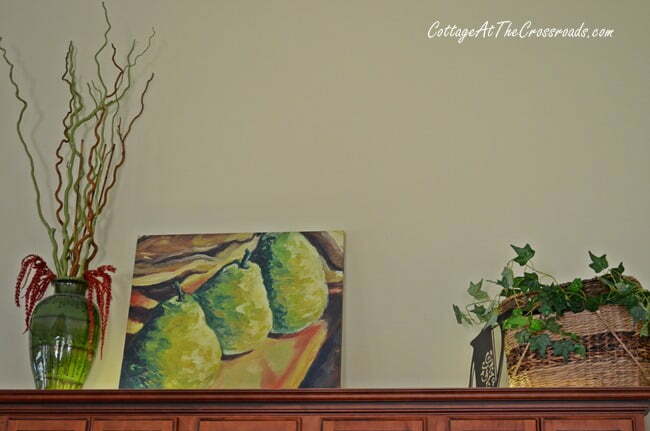 This pear painting resides on top of Nancy’s kitchen cabinets. Such a beautiful setting for a ladies’ luncheon. After some of the others arrived, we grabbed some stools in the kitchen and Rachael got started with her cooking demonstration. First she got some chicken thighs roasting that she had previously marinated. Then she made a roasted red pepper sauce to serve over the chicken. The whole time she was working, she was telling us about the health benefits of each ingredient. 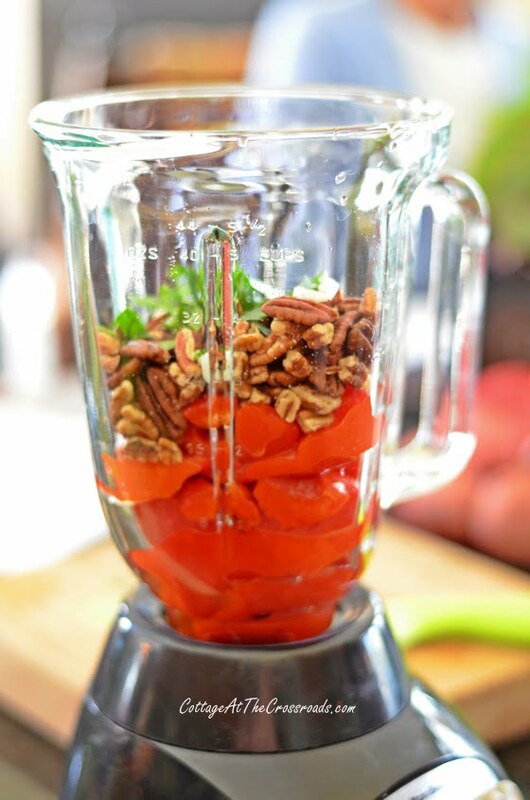 Do you see the pecans in the blender? 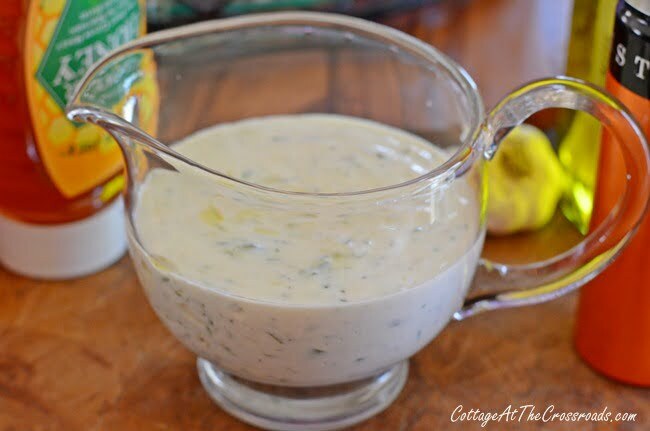 They make all the difference in the sauce, not only nutritionally but taste wise, too. A tip she gave us was to eat a variety of nuts, not just one kind. Each type of nut contains different compounds that our bodies need. Rachael gave us copies of the recipes that she made for our lunch, and she has graciously given me permission to make them available to you. So if you’d like her recipe for her Chicken with Roasted Red Pepper Sauce, click HERE. While the chicken was cooking, Rachael grilled these delicious kebabs. 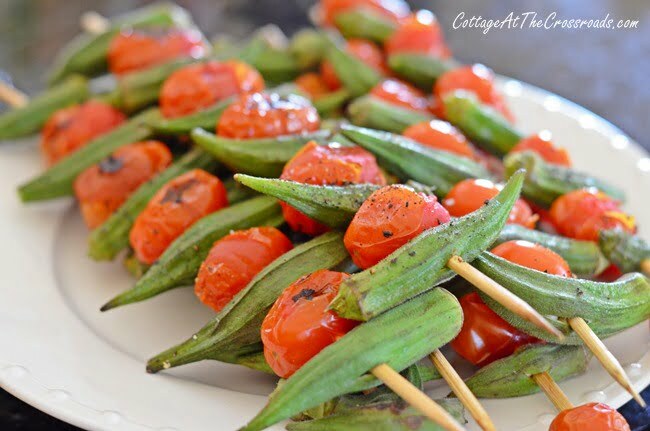 Click HERE for her Okra and Tomato Kebabs recipe. When the chicken came out of the oven, in went some potatoes. See the purple potatoes? She said they contain more antioxidants than other potatoes yet they taste the same. Another tip she gave us was that if you allow cooked potates to cool down and then reheat them later that it reduces their glycemic index and changes their starch level. I was so glad to hear that because Leo and I have been following a low carb diet since January. Yay! Potatoes are back on the menu! 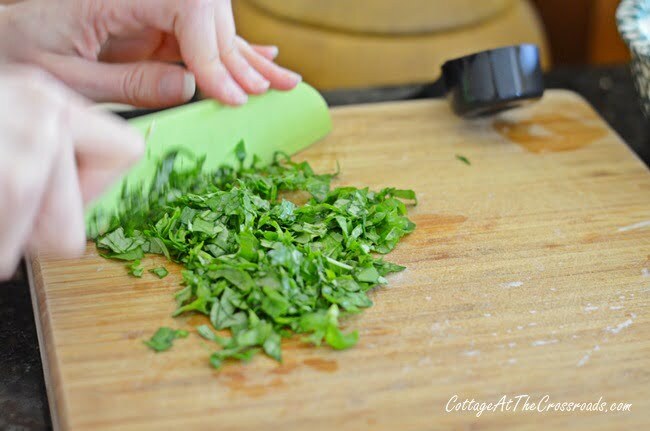 After she got the potato and green beans salad together, she started chopping some basil and parsley to put in a dressing for the salad. I had picked the herbs from our garden earlier in the day for her to use. She said to use fresh herbs for more than just their taste and to incorporate them in as many dishes as you can for their nutritional value. For example, she said parsley has 44 times Vitamin C than lettuce so I’ve been putting it in our salads ever since I heard that! Rachael also urged us to make our own salad dressings instead of buying prepared ones. She said homemade ones will keep in the refrigerator for about a week. She used organic yogurt in making this one because it has a greater percentage of “good for you” Omega fats than regular yogurt. 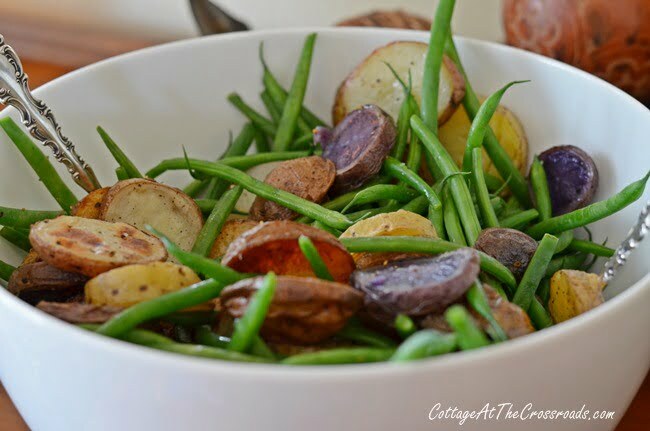 Click HERE to get the recipe for Roasted Potato and Green Bean Salad with Herbed Yogurt Dressing. At this point, we all couldn’t wait to help our plates to this delicious looking food! 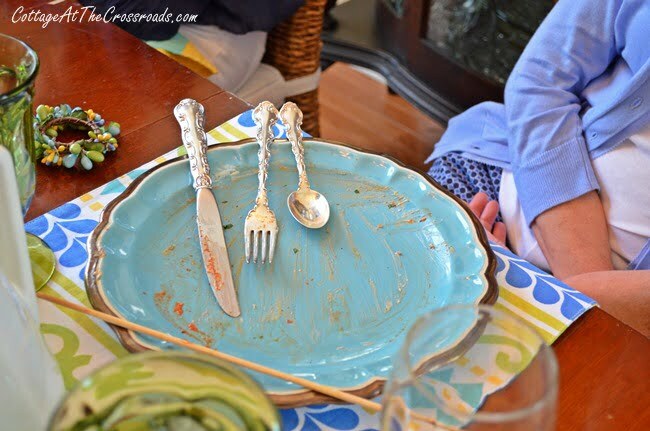 And all of our plates looked just like this when we finished, proving that healthy food can taste GOOD! A little later, we had some frozen yogurt that Rachael had made in her countertop electric ice cream maker. You just wouldn’t believe how good and rich it tastes! Click HERE for her Peanut Butter and Banana Frozen Yogurt recipe. You know, eating healthy can be daunting, especially if you have a chronic disease or disorder. But Rachael is available to guide you in nourishing your body instead of making you feel deprived. Individual and group appointments are available for persons who live in the Columbia, SC area, or she can consult with you by telephone or via Skype.She’s also available for classes in Asheville, Charlotte, Greenville, and Charleston with a travel fee. Think how fun it would be to get a group together to do a healthy cooking class like she did for us. If you are interested in any of her services, you can contact her at AnAvocadoADayRD@gmail.com. You can also find additional healthy recipes on Rachael’s blog An Avocado A Day. It was truly a special day with my forever friends. I’m blessed with their friendship and with Rachael’s knowledge. What a great “party” to have….the tablescape was gorgeous and the centerpiece so pretty and oh so creative!…I must tell my hubby about the potato tip….he does not eat pasta, potatoes, or rice due to the glycemic index…(he is a nutrition nut)….we have a new VitaMix and experimenting on juicing, soups, and even frozen dishes…So glad you were able to spend some time with the ladies of your old Bunco group….I love my Bunco ladies…thanks for sharing this fabulous information and Nancy’s beautiful home!! That sounds like so much fun and a great opportunity for all of you. Nancy’s home is beautiful. That sounds so fun and educational too! I’m going to check out her blog too! I am so jealous (in the best nicest way)! What a wonderful time you girls must have had!~ The food looks soooooo yummy! I need some healthy cooking lessons! Will we see you at Haven this year? I sure hope so!!!! Everything looks beautiful and yummy! The cooking classes sound like fun and something I need! Can’t wait to try some of the recipes! Thanks for sharing them! Lunch looks delicious and healthy too Jane! 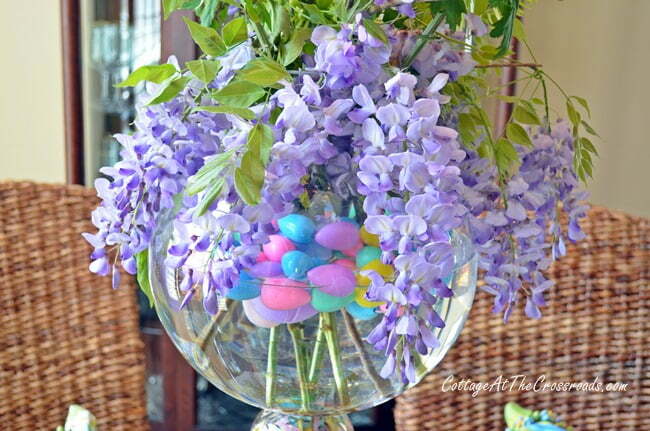 I love the centerpiece vase with the eggs underneath and floating! The wisteria is a beautiful and fragrant addition. Wishing you and Leo a Happy Easter! 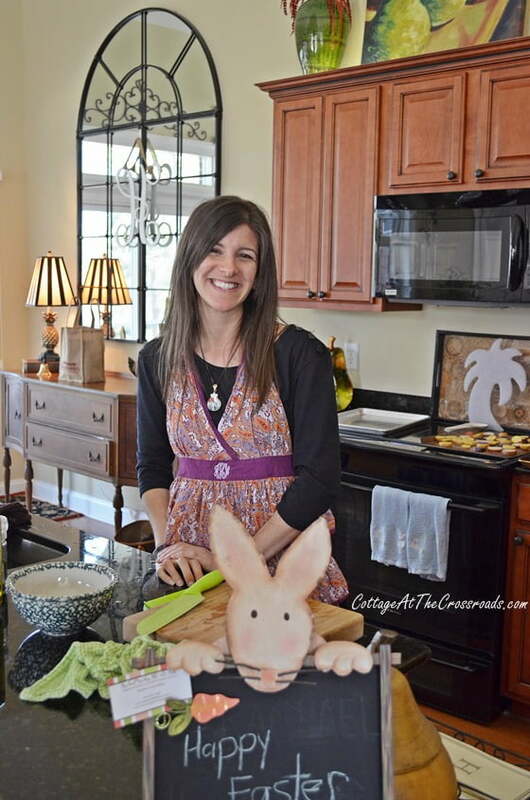 Thanks for sharing, I’m trying all the recipes for my Bunco group. It’s good to see all of the Bunko friends. Now, let’s eat.